Coming off a hard-fought battle against the Orlando Magic the night before, the Raps had another tough test against former teammate, Chris Bosh, and the Miami Heat last night. But Bosh didn't get a chance to stick it to the Raptors last night, finishing with just 12 points and 6 boards in only 22 minutes due to foul trouble. Miami started the game with a 7-0 run and pretty much maintained the lead the whole 48 minutes. 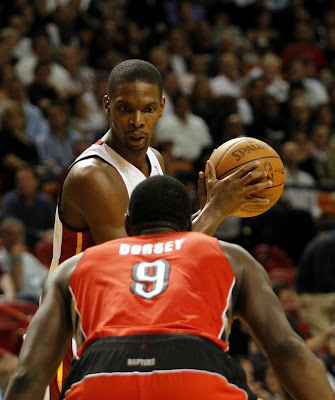 Dwyane Wade helped the Heat build on their 13-point halftime lead to an 18-point lead midway through the third quarter. Then the Raps started to chip away at the Heat's lead. DeMar scored 8 of his 21 points in the fourth quarter when the Raptors' made a run. The Raps got as close as four points but would never take control of the game. With Miami off two straight losses, the Heat put the pressure on to avoid a three-game losing streak. The Raps got a decent rebounding night from Andrea Bargnani who grabbed nine boards and also went 8 for 23 for 22 points. Joey Dorsey picked up Reggie Evans' slack grabbing 11 boards as Evans was a late night scratch with flu-like symptoms. Dwyane Wade led the Heat with 31 points and 9 boards while LBJ finished with 21 points and 11 dimes. Udonis Haslem had a double double (10 points, 10 boards) off of the bench for the Heat.